Despite not being very dedicated to any specific routine, I've found a few skincare bits that I really quite enjoy and that I thought would be worth sharing with you guys. Let's start with that little block of gray soap. It's actually the Drunk Elephant JuJu Bar, an "ultra-mild, three-in-one bar that deeply cleanses, subtly exfoliates, and heals skin." My combination-slightly oily skin likes this cleanser and I use it a few times per week instead of a regular cleanser to give my skin a deeper cleanse. It probably is gentle enough for daily use but, like I said, I've just been so all over the place with my skincare that I don't have a set routine. I purchased a mini size of this in a set with the Pekee Bar, the more moisturizing cleanser, and I'm excited to try that out after I'm done with JuJu. 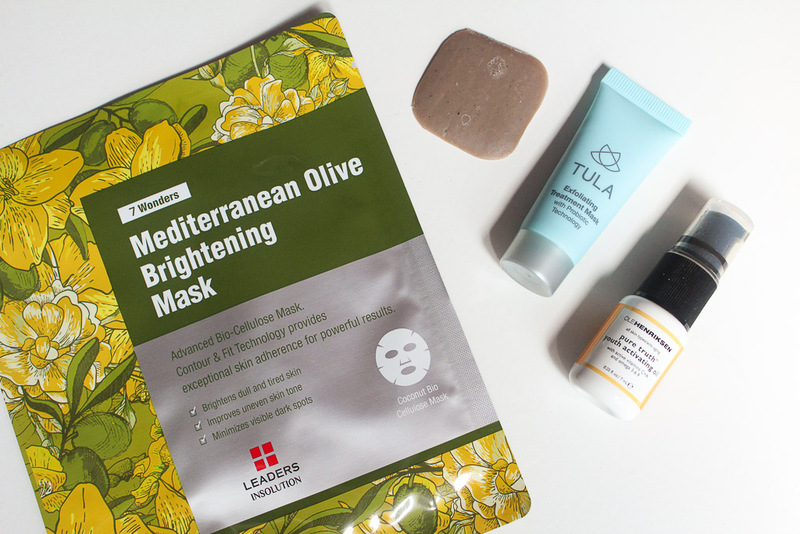 Leaders Insolution has been one of my favorite sheet mask brands for a few years (beginning of 2014 if you want to get into specifics) and they've only cemented their place at the top with the 7 Wonders Mediterranean Olive Brightening Mask. I purchased a box of these on a whim from Besfren Beauty, a beauty boutique in Manhattan's K-Town, because they were having a crazy good special on their masks. Something like 3 boxes of 10 for $35. These masks usually retail for $6 a piece at Ulta but the Leaders Insolutions website often has 50% off deals. Anyway, my point about the price is that these are definitely worth a try. The bio-cellulose sheet mask is very thin and comfortable and there is a lot of essence to plump up your skin. I do notice a slight brightening effect with this mask and I just love the way my skin looks after using it. After a stressful day, I usually try to make a point to treat my skin to one of these masks before going to bed. I'm kind of wary of clay-based masks because my skin tends to feel too tight and dry after using them or the masks are a huge pain to wash off. The Tula Exfoliating Treatment Mask does none of those things and that's why I like it a lot. I got this in the SpaceNK spring GWP (the full size tub is $54 - eek!) and I'm dreading the day is runs out. I like that this mask has biodegradable beads that give you a gentle exfoliation when you're rinsing this off too. After using this, my skin looks more toned and my pores appear smaller. The effects are, sadly, temporary but I like to think of it as giving my pores a hard reset. The Ole Henriksen Pure Truth Youth Activating Oil is so underrated! I never heard about this face oil until I got a sample of it in a Ole Henriksen GWP (they do an awesome mega-GWP bi-annually). Yes, this oil is bright orange and yes, it will tint your skin ever so slightly right after you put it on if you're really fair. BUT it makes my skin glowy and hydrated immediately after I apply it. If you want instant results, this will give you them. I wake up the next day and my skin is supple without a hint of grease. I'm down to my last few drops of this sample and I'm highly considering buying a full size of this next winter. Have you guys tried any of these products? What skincare have you been loving? 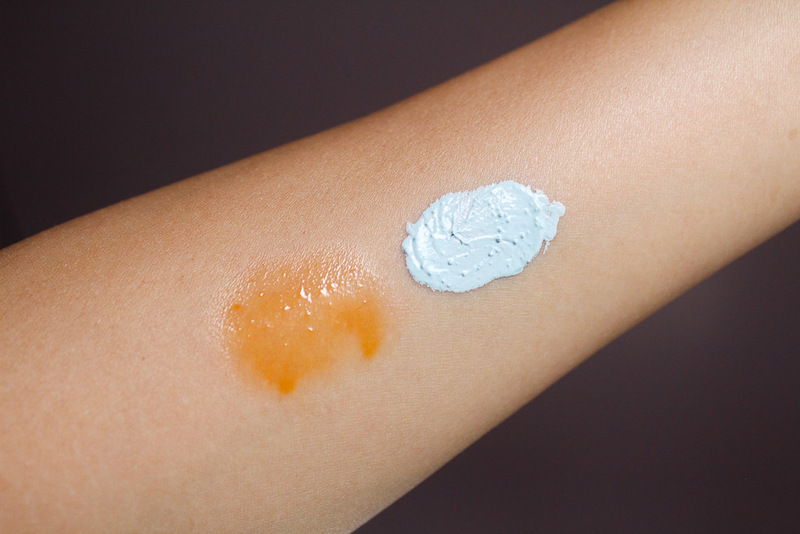 I'm really curious to try The Ordinary which recently debuted on Beautylish and First Aid Beauty has a couple of new chemical exfoliants that look really appealing.